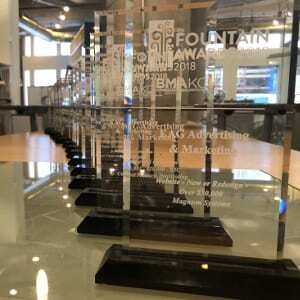 May 16, 2018 (KANSAS CITY, MO) – EAG Advertising & Marketing, Kansas City’s premiere outsourced marketing department for small business, was presented with a record 16 Fountain Awards, and four Certificates of Merit at the Business Marketing Association’s (BMA) and American Marketing Association (AMAKC) Fountain Awards Celebration held May 14, 2018 at Boulevard Brewing Company. “EAG is very active in both the BMA and AMAKC, as these organizations provide valuable education and networking opportunities that allow our team to continually build innovative campaign strategies for our clients” states Michele Markham, BMA president and EAG Advertising & Marketing president. The Fountain Award judging criteria is based on creative (25%), production (25%), objective/strategy (25%) and results (25%) in categories that include advertising, brand identity, sales enablement, event marketing, public relations and all forms of digital marketing. “Participating in the BMA/AMA Fountain Awards is important to us because entries are judged not only on creative approach, but also strategy and results. Having our advertising and marketing work recognized by the BMA is rewarding, and each award emphasizes what we promise to our clients: advertising and marketing is only good when it works,” explains Paul Weber, EAG Advertising & Marketing CEO and chief strategy officer.